 Encouraged by his father, the eccentric descendant of an old French family, to daydream, Degouve shared a studio with Toorop, who influenced him. He was married to the sister-in-law of the Belgian poet Emile Verhaeren. In Paris he was encouraged by Rodin, Puvis de Chavannes, and Maurice Denis. His paintings have a highly private quality of invention and represent nuncquests into places of mystery, where unexpected adventures may suddenly occur. He remained true to the imaginative intensity of his youth and continued to produce works with Symbolist themes into the Twentieth century. From 1900 to 1902 Degouve de Nuncques lived with his wife in the Balearic Islands; he painted the rugged coastline and the orange groves. After suffering a religious crisis in about 1910, he painted pictures that revealed his tormented state of mind, and during World War I, while living as a refugee in the Netherlands, he produced only minor works. In 1919 he was overwhelmed by the death of his wife and lost the use of one hand. In 1930 he married the woman who had helped him through this crisis. They settled in Stavelot, where he devoted himself to painting snow-covered landscapes. — The Pink House (1892, 63x43cm; 119kb) _ This painting is also known as The Shuttered House or The House of Mystery. It is said to have inspired paintings by Magritte such as Empire of the Lights (750x574pix, 83kb). — The Angels of the Night (1894, 48x60cm; 145kb) _ Also known as Angels in the Night. The works of Degouve de Nuncques are often a poetic evocation of childhood daydreams This is as true of The Pink House as of this nocturnal vision in which angels kiss in a ghostly, supernatural park.  Nocturnal Effect (1896, 47x68cm) _ The artist often depicts isolated houses in the night and the fog, with only a few weakly lit windows to suggest that they are inhabited. ^ >Died on 28 February 1923: Fran�ois Flameng, Parisian painter and draftsman born on 06 December 1856. — He was the son and student of the engraver of L�opold Flameng [1831-1911] and was taught by Alexandre Cabanel, Edmond Hédouin, and Jean-Paul Laurens. He first exhibited at the Salon in 1873, working initially as a history and portrait painter. He produced several large historical compositions such as Conquerors of the Bastille (1881), painted in an academic style characteristic of the Third Republic. 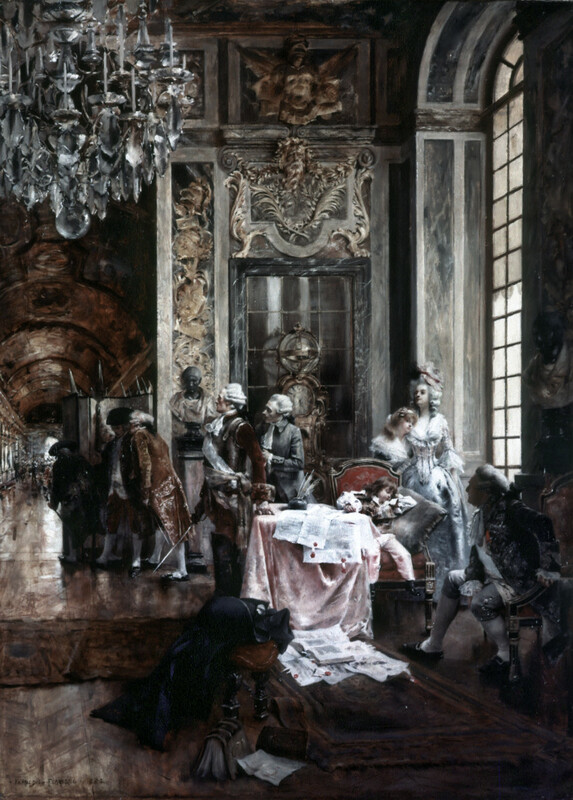 He also worked as a decorative painter, producing nine panels for the great staircase of the Sorbonne in Paris depicting the foundation of the university and the history of French literature, for example Saint Louis Delivering the Founding Charter to Robert de Sorbon (1887) and Moralists of the Court of Louis XIV: La Rochefoucauld and Molière. He decorated the ceiling over the staircase in the Opéra Comique in Paris with paintings that owe something to Degas, such as Tragedy and Dance (1897), but more to Boucher (Comedy Pursuing the Vices). He contributed to the design of the Salle des Fêtes at the Exposition Universelle in Paris in 1900 with three enormous compositions, Silk and Wool, the Decorative Arts and the Chemical Industries (all destroyed). Flameng also produced ceiling paintings for the buffet at the Gare de Lyon (in situ) in Paris as well as wall and ceiling paintings for numerous public and private buildings, including the Hôtel des Invalides in Pari, the Grolier Club in New York and the Charitonenko Palace in Moscow. In 1903 he collaborated with Léon Bonnat, P.-A.-J. Dagnan-Bouveret, Gustave Colin, Léon Glaize, Charles Lapostolet, Joseph Layraud and Tony Robert-Fleury on the decoration of the Salon des Arts in the Hôtel de Ville in Paris, contributing Music, a panel painted in a Symbolist style. — François Flameng and Paul Helleu (1885, 53x43cm; 657x531pix, 116kb) by John Singer Sargent [1856-1925] _ By the time Sargent painted François Flameng with his friend Paul Helleu behind, he was an already accomplished French painter. François was known for his genre, scene, and portrait paintings, and later known also for his powerful illustrations of the Great War. His father Léopold was an engraver and so he became exposed to art at a very young age. François studied at the École des Beaux-Arts and at the atelier of Cabanel. His first submission to the Paris Salon was in 1875 (at the age of 19) with the painting Le Lutrin (with a singer). Shortly after he was drafted into the army which briefly postponed his career. This later served him well for his empathy of the soldier during WWI when he became an official war artist for France. In 1889 he won the Prix du Salon during the l'Exposition Universelle for his L'Appel des Girondins, depicting the last breakfast in prison of the Girondins before their call to execution. He later became a professor at the academy of Fine Arts. — Princess Z. N. Yusupova with her Two Sons at Arkhangelskoe (1894) also her little dog, in the foreground. The sons are in the background. ^ 1994 Arne Ekeland, Norwegian painter born on 14 August 1908. Early cubistic and surrealistic influences, together with a lifelong communistic conviction, lead to a personal style so heavily expressive that Ekeland would not receive general recognition until late in his career. Ekeland's later production is in almost every phase characterized by a both decorative and machine-like style. His paintings from the 1950s are characterized by a �cogwheel style�, with industrial symbols and high-flown liberational themes. Through the 1960s Ekeland developed an ornamental but hard and metallic style. Titles like Catastrophe, Apocalypse, and Technological Landscape bear witness to a critical stance on capitalist society�s exploitation of humans and nature. After a journey to China in 1966, Ekeland developed a more organic style where softer lines seem trimmed with glimmering mother-of-pearl. The paintings form an obvious parallel to the psychedelic ornaments of the hippie movement. Today, Arne Ekeland almost appears as a godfather for the forms we now experience in the computer-manipulated cyberspace. — Han gikk p� Kunstakademiet under bl.a. Axel Revold. Laget verker som f.eks. �V�ren�, �Perlebekken�, �Angst� og �Frihetens s�stre�, som henger p� Stortinget. Han var en av de som holdt p� med alle kunstarter - bl.a. silketrykk, tusjlaveringer, akvarell, gouach og selvf�lgelig oljemaleri - som han er mest kjent for. Han var en politisk maler, han var medlem av Norges Kommunistiske Parti, i mesteparten av sitt voksne liv. Mange av bildene hans var sterkt preget av hans politiske syn, anti-krig, humanisme, og skj�nnheten han s� rundt seg i naturen og familien sin. Han var samboer med Margot, og en aktiv kunstner fram til sin d�d. — The Trinity (1937, 200x235cm; 480x563pix, 40kb) multicolored crowd with three standing taller; some have faces upturned. — (trinity without crowd?) (638x500pix, 64kb) barely distinguishable because of low contrast between shades of red. ^ 1989 William Scott, British painter born on 15 February 1913. ^ 1986 Fred Kabotie, US Hopi painter born in late February 1900. — Father of Michael Kabotie [03 Sep 1942~].— Fred Kabotie was one of the founders of the school of modern Hopi painting. At age 15 he entered the Sante Fe Indian school where his artistic talent was encouraged. He later worked at the Museum of New Mexico and the School of American Research before returning to the Hopi Mesas in 1937 as an art teacher at the Oraibi High School, where he was a major influence on the development of a unique Hopi painting tradition. ^ 1983 Hendra Gunawan, Indonesian painter born in Bandung on 11 June 1918. ^ 1976 Joseph Anton (or Antoon) Rooskens, Dutch painter born on 16 March 1906, specialized in simulations of pictures made by kindergartners. — Geboren in Griendtsveen. Overleden in Amsterdam. Anton Rooskens bezocht van 1924 tot 1934 de technische school in Venlo en ging daarna in de leer bij een instrumentenbouwer. In 1935 vestigde hij zich in Amsterdam. Als schilder was hij autodidact. In het werk, dat hij in de dertiger jaren maakte, voornamelijk landschappen, is de invloed van Van Gogh overheersend. In 1945 bezocht Rooskens de tentoonstelling �Kunst in vrijheid� in het Rijksmuseum in Amsterdam, waar hij werd geconfronteerd met Afrikaanse sculpturen en voorouderbeelden uit Nieuw-Guinea. De vereenvoudigde strakke vormen van deze kunst zijn terug te vinden in zijn werk van vlak na de oorlog waarin waarschijnlijk ook sprake is van be�nvloeding door het kubisme. Sinds 1946 had Rooskens regelmatig contact met Appel, Corneille en Brands. In 1948 leerde hij Constant kennen en was in hetzelfde jaar mede-oprichter van de Nederlandse Experimentele Groep die later opging in Cobra. Rooskens nam deel aan de tentoonstelling in het Stedelijk Museum in 1949. Onmiddellijk daarna trok hij zich terug uit de beweging. Het contact met Cobra bleek voor Rooskens zeer stimulerend. Hij ontwikkelde een eigen taal van magische tekens in indringend zwart, geel, oker, blauw en rood en schilderde composities waarin maskers, schilden en godenbeelden verstrengeld raken in een wirwar van spontaan neergezette kleurvlakken en lijnen, die ondanks dat toch een zeker evenwicht bezitten. In 1954 schilderde hij onder invloed van Afrikaanse kunst korte tijd in een geometrische stijl. Vanaf 1956 zette hij in een steeds bewogener trant abstracte tekens op grote doeken waarin de met forse streken opgebrachte zwarte verf een prominente aanwezigheid heeft. Halverwege de jaren zestig doken de aan de Cobra-periode herinnerende fantasiewezens weer op en werden de schilderijen wat lichter van toon. Van Rooskens, die een grote belangstelling voor etnografie had en herhaaldelijk reizen maakte naar Afrika, de Verenigde Staten, het verre Oosten en Groenland, is vanaf het einde van de jaren vijftig regelmatig werk te zien geweest op diverse nationale en internationale tentoonstellingen, waaronder een in 1976-1977 door Nederland, Belgi� en Duitsland reizende retrospectieve. �- Untitled (1965; 534x841pix, 94kb) looks like astronauts (including a dog) as much or as little as the preceding looks like the Mediterranean. �- Untitled (791x961pix, 105kb) a kindergartner's attempt at picturing mechanical birds? _ Twenty-Eight Million Eight Hundred Thousand Pixels aka Tall ! (2006; 36'000pix x your_screen's_width, 383kb) which is designed to be viewed as a moving picture by slowly scrolling vertically, and could not have been made by your average kindergartner (but aren't they all above average? or is it only those in your family?). �- Untitled (760x960pix, 88kb) _ Cats looking into the cobwebbed portholes of an ocean liner in drydock? �- Untitled (30x38cm lithograph; 572x720pix, 70kb) _ Double portrait of mom and dad (by the usual kindergartner, of course)? ^ 1943 Willem Adriaan van Konijnenburg, The Hague Dutch artist born on 11 February 1868. ^ 1918 Nikolay Nikanorovich Dubovskoy, Russian Kazakh landscape painter born on 17 (or, if that is Julian, on Gregorian 29) December 1859. He studied from 1877 to 1881 at the Imperial Academy of Arts in Saint Petersburg under Mikhail Konstantinovich Klodt, but did not complete the course. 1896 Josef Munsch, Austrian artist born on 04 October 1832. 1808 Nicolaes Muys, Dutch artist born on 21 April 1740. 1786 Jacob-Andries Beschey, Flemish artist born on 30 November 1710. ^ 1946 Stoian (or Stoyan) Tzanev, Bulgarian printmaker and painter. In 1973 he graduated in printmaking from the Academy of Fine Arts (Akademia Sztuk Pieknych) in Warsaw, Poland. His works, especially his prints, are filled with symbols and visual metaphors that relate to themes from Bulgaria�s cultural and historic heritage. There are elements of the grotesque and the phantasmagoric, as well as paradox and irony, in his oils and acrylic paintings (e.g. Idol, 1985). 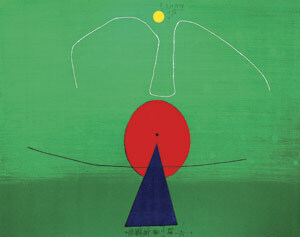 Tzanev prefers to employ a variety of techniques in printmaking, favoring soft-ground etching and aquatint (Embrace, 1982), color lithography and mixed media. As a printmaker he has exhibited in various biennales of graphic art, including the International Biennale of Graphic Art in Krak�w and one in Heidelberg. In 1987 he won the Grand Prix at Intergraphic in Berlin. — The day of Saint Anthony (1997 lithograph, 45x57cm; 237x300pix, 11kb) small image, yet bigger then necessary. 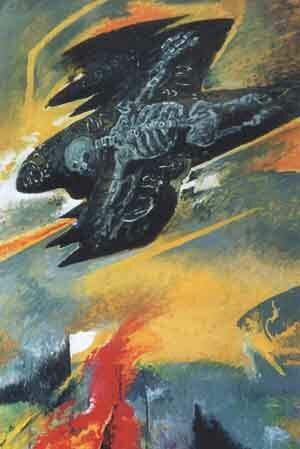 — Death Flies Along (1999; 449x300pix, 17kb) comment on the NATO intervention to protect Kosovo. ^ 1908 William Menzies Coldstream, English painter who died on 18 February 1987. He moved to London as a young child with his family and for reasons of health studied privately, intending to become a doctor like his father. Gradually, however, he became interested in drawing and painting, which led him to study at the Slade School of Fine Arts in London from 1926 to 1929. In the latter year he exhibited with both the New English Art Club and the London Group, to which he was elected a member in 1934. In the works that he painted during this period, such as The Table (1932) and Studio Interior (1933), he demonstrated his cultivation of a sober and measured representational style applied to prosaic domestic subject-matter and to the human figure. — The son of a doctor, William Coldstream was born in Belford, Northumberland, and grew up in north London. Educated locally, he attended the Slade School 1926-9, an institution with which he would be associated for most of his career and where he formed important friendships with such artists as Claude Rogers and Rodrigo Moynihan. In 1933 he held a joint exhibition with H.E. 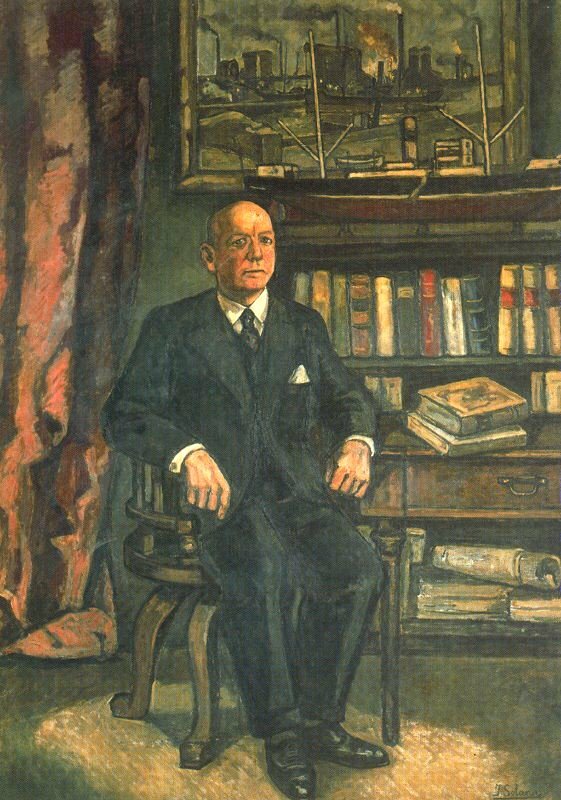 du Plessis, sponsored by the London Artists' Association, at the Cooling Galleries; he first showed with the London Group in 1929, became a member in 1933 and showed sporadically until the late 1960s. In 1931, he married Nancy Sharp, a fellow Slade painter; they had two daughters before their separation in 1939. 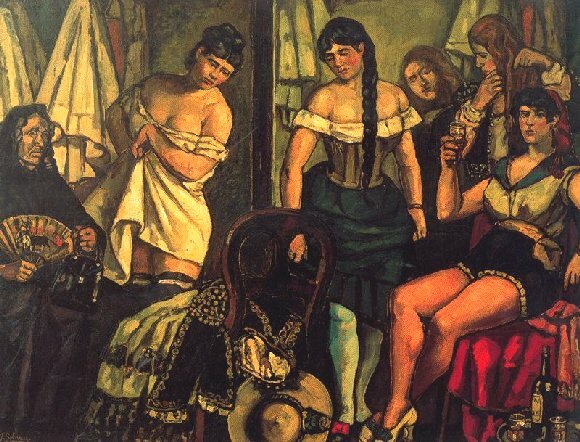 In 1940 he enlisted in the army and trained as a gunner until commissioned as an official war artist in 1943. He visited Egypt that year and Italy in 1944. He returned home in July 1945 and joined several friends as a tutor at Camberwell School of Arts and Crafts in November. He became Head of Painting in 1948 but was appointed Slade Professor of Fine Art, University College, London the following year. Through his position at the Slade, Coldstream became a key art world official. He was a trustee of both the National Gallery (1948-1963) and the Tate Gallery (1949-1963), a director of the Royal Opera House (1957-1962) and chairman of the British Film Institute (1964-1971). Having chaired the Art Panel of the Arts Council of Great Britain (1953-1962), he became Vice Chairman of the Council (1962-1970). As Chairman of the National Advisory Council on Art Education (1958-1971) he was said to have reshaped British art education through what became known as the First and Second Coldstream Reports (1960 and 1970). — Michael Andrews was a student of Coldstream. — Winifred Burger (1937, 79x56cm) _ Coldstream studied at the Slade School of Art and then tried to make his living as a professional artist. Shortage of money, however, forced him to teach and, from 1934 to 1937, to work with the pioneering documentary film-maker, John Grierson, at the GPO (General Post Office) Film Unit. In 1937 Coldstream and others founded the Euston Road School of Drawing and Painting. This was Coldstream's first portrait on his return to full-time painting. It was commissioned by the sitter's husband and painted at the Burgers' flat in Upper Park Road, Hampstead. 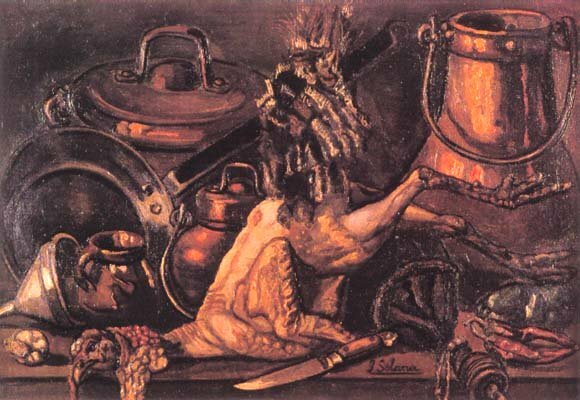 The portrait surived the bombing of Burgers' flat during the war. — On the Map (1937, 51x51cm) _ In this picture Coldstream shows fellow-artist Graham Bell standing holding a map, and his friend Igor Anrep sitting on the ground. Seen from behind, they look out across the landscape, apparently unaware of the painter�s presence. This conceit recalls such paintings as Degas�s Femme � sa Toilette, which Coldstream had praised for its �unbiased observation�. 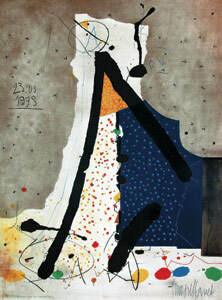 Such observation was to be a fundamental part of his painting from 1937 onwards. ^ >1894 Wijtze Gerrit Carel “Wim” Schuhmacher, Amsterdam Dutch painter who died on 05 Jun 1986. — Randolph, New Hampshire (1915, 51x61cm; 672x800pix, 151kb _ ZOOM to 1311x1561pix, 437kb) _ Marguerite and William Zorach spent the winter seasons in New York City, soaking up the avant-garde ideas in the paintings and sculpture shown at Alfred Stieglitz's 291 gallery and elsewhere while seeking exhibition opportunities for their own art. The warm months were for rejuvenation; between 1915 and 1918, the Zorachs spent several summers in New Hampshire. Although each of them would later specialize in other media (Marguerite became well known as a textile artist and William became one of the leading sculptors of the modernist generation), during this period they were both active as painters. Their styles, based on their experiences as art students in Paris a few years earlier, combined the vivid palette of Fauvism with Cubist compositional structure. Each of them turned to the landscape of the surrounding White Mountains as subject matter. In this case, their responses are found on either side of a single canvas: on the back of Marguerite's 1917 Whippoorwills is William's Randolph, New Hampshire, painted two years before. It is not known why the Zorachs chose to paint on both sides of a single piece of canvas. They were extremely poor in those years and may have been driven to work in this unusual manner for reasons of economy. But the double-sided canvas is also an expression of the collaborative spirit that marked their careers, and their marriage. They frequently had joint exhibitions; Marguerite drew embroidery motifs from images in William's paintings, while he based sculptural elements on her needlework designs; and a number of Marguerite's embroidered pictures were worked on (and signed) by both of them. Both sides of this painting reflect the Zorachs' pleasure in their summers in New Hampshire, where they lived rent- and relatively care- free in handsomely sited if dilapidated farmhouses that were loaned to them by generous patrons. William presented New Hampshire as Arcadia, with sensuous, Matisse-like nudes lounging in a bucolic landscape. He uses bold, bright colors reminiscent of French Fauvism. Marguerite's response to their surroundings was much more direct. The rolling hills, leafy woodlands, little waterfalls, and houses nestled in the valleys shown here are an accurate portrayal of the cozy landscape near Plainfield, New Hampshire, where they lived in 1917. The warm earth tones emphasize the organic quality of her picture. She molds the hills and trees into flat, decorative shapes, creating a tapestry-like pattern. Her technique also resonates with her work in textiles, for she paints thinly so that the canvas weave creates a background texture for her design. At the same time, she is a keen observer of nature: she accurately portrays the whippoorwills as having short rounded wings and rounded tails. Nocturnal birds, they soar by on the surface of the picture, beneath a crescent moon. _ New Ham, Sire aka Nap Pan (2006; screen filling, 246kb _ ZOOM to 1414x2000pix, 794kb),.  Still Life with Dead Turkey (1929, 73x104cm; 400x580pix, 63kb) copper-color monochrome..
— The Mask and the Doctors (1928, 65x55cm; 580x488pix, 73kb) almost monochrome. �- Máscaras de Pueblo (1935, 55x71pix; 892x1188pix, 143kb) _ The peculiar and tragic expressionism of Solana is momentously captured in Mascaras de Pueblo. The heavily impastoed paint and the masked subjects link Solana's painting directly to Goya's oeuvre (see fig. 1). Both artists favoured the use of dark palettes and `dirty' paint surfaces for the expression of moral misgiving and psychological unease. The poet Antonio Machado called his friend a `neocromatic Goya,' who `paints with insane voluptuousness, treating life as though it were death, death as though it were life' (John F. Moffitt, The Arts in Spain, New York, 1999, p. 198). Solana's distinctive ability to make animate the inanimate injected life into the masks and mannequins, many of which peopled his studio in Madrid and were used again and again in his paintings. Like the Belgian Symbolist and Realist artist James Ensor, masks gave Solana a means of transgressing the codes of normal practice and freedom from social constraints (see fig. 2). The fanciful, grotesque, macabre and melancholic melange of creatures translated into an air of desperation and anarchy in the face of what Solana considered to be the bleak reality of modern Spanish life. 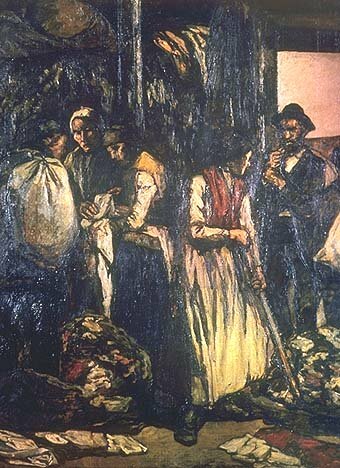 The heavy contours, shallow pictorial depth and cut-off figures further create an imposing and threatening undercurrent to the composition. The work of Solana defies categorization. Never academic, he expressively, often movingly, humanized the macabre and linked the heritage of Goya to the art of the twentieth century. �- S*#> Murga Gaditana II (1935, 32x42cm; 510x679pix, 98kb) _ Murga Gaditana I and II are partcularly lively and rhythmic examples of Solana's preoccupation with the masquerades and processions that he had watched and participated in while growing up in Madrid and Santander. This theme provided the artist with a subject that was essentially Spanish in spirit and custom. While much of Solana's oeuvre sought to convey the grim and dreary reality of contemporary urban existence (see lot 35 and 36), works such as the two present drawings seemed to be caught in a dichotomy between poverty and hardship on the one hand, and community, friendship and celebration on the other. The endless circular rhythm of the characters and their musical beats evoke a sense of life resisting time, posing questions of mortality which are always present in Solana's works. ^ 1880 Martiros Sergueeevitch Sarian, Armenian artist who died in 1972. Sarian est consid�r� comme le p�re de la peinture moderne arm�nienne. Se d�veloppant dans le courant des nouvelles tendances artistiques, il fut le premier � r�aliser la n�cessit� d'�laborer un style individuel bas� sur les vieilles traditions nationales. Il naquit dans la petite ville arm�nienne de Novy-Nakhitchevan pr�s de Rostov le Don. Il �tudia � Moscou dans les ateliers de V. Serov et C. Korovine. Les impressions de son premier voyage au pays de ses anc�tres (1901) se retrouvent dans son cycle panth�istique "Contes et R�ves" r�alis� sous l'influence du symbolisme. Se r�f�rant � l'esprit populaire, Sarian repr�sente la nature, les gens, la v�g�tation, les animaux, les oiseaux, comme une famille unique, un paradis terrestre. "La nature engendre l'homme pour qu'elle puisse � travers ses yeux se voir, s'�merveiller de sa propre beaut�", c'est ainsi qu'il d�finit sa philosophie de la nature. En 1909, Sarian se tourna vers la r�alit� vivante, choisissant des motifs que la civilisation n'avait pas encore touch�s et portant l'empreinte d'une vie s�culaire. G�n�ralisant � l'extr�me la nature, il r�v�le l'expressivit� des formes. Il construit sa composition sur un seul plan en r�partissent r�guli�rement de grandes taches de couleur pure, s'inspirant du principe des vieilles miniatures arm�niennes. Les couleurs de Sarian irradient la lumi�re. La combinaison harmonieuse et contrast�e de trois ou quatre tons principaux permet au peintre d'obtenir expressivit�, chaleur et luminosit�, la lumi�re et les couleurs suaves et chantantes qu'elle engendre sont devenus des symboles de la patrie du peintre. Hautement appr�ci� en Russie, Sarian, � la diff�rence de ses coll�gues Marc Chagall et Kandinski ne partit pas en Occident, mais resta en Arm�nie pour se donner enti�rement au renouveau de sa patrie. 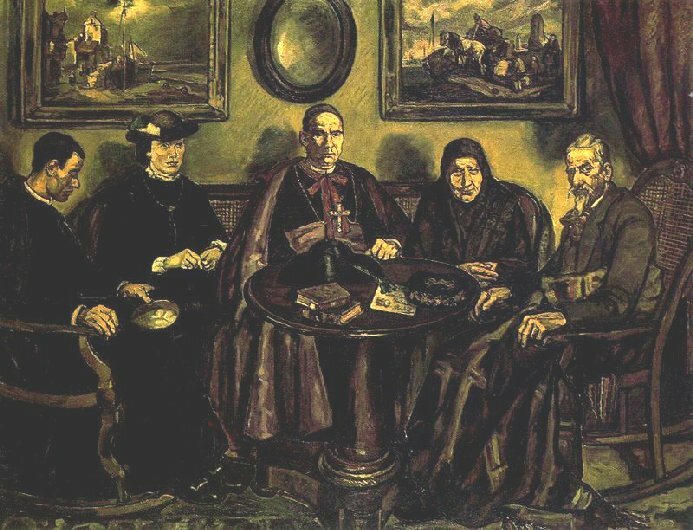 ^ 1871 Leo von König, German painter who died in 1944. At the age of 16, Leo von K�nig switched from the studio of the sculptor Carl Boerner from Hamburg to Franz Lippisch's studio in Berlin in order to prepare for the Akademie der Bildenden K�nste. His teachers at the academy were Julius Ehrentraut and Ernst Hancke. From 1894 to 1897 von K�nig continued his education under Jules-Joseph Lefebre and Tony Robert-Fleury at the Acad�mie Julian in Paris. Afterwards the young artist returned to the capital Berlin, where von K�nig made his debut at Berlin's big art exhibition in 1896. 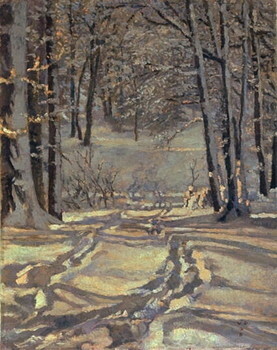 In that same year, he became a member of the Munich secession; four years later he joined the Berlin secession and exhibited at their exhibitions from then on. Starting in Berlin, the painter travelled extensively even before World War I; one of his most important trips being the one to Spain and Portugal together with Julius Meier-Graefe from April to October 1908. Leo von K�nig acquired a large-format El Greco-copy on this trip and painted a series of impressions of his travels. 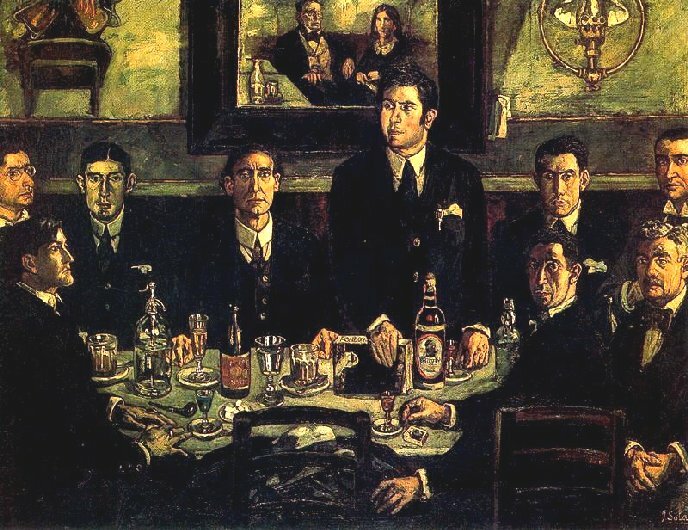 When K�nig, together with Emil Nolde and Max Beckmann, demanded "a free organisation, free artists, free speech" during a longer conflict among the Berlin secession in 1910 and saw the organisation in need of reform, his suggestions were flatly rejected by its committee. His following resignation led to the foundation of the "new secession". Being particularly gifted in portraits, K�nig achieved some remarkable things in this field. His soft, loose, broadly spaced characteristic style, together with his subtle understanding of the human psyche results in creations of extraordinary charm. — Er studierte 1889-1893 an der Hochschule f�r bildende K�nste Berlin, 1894-1897 an der Acad�mie Julian in Paris. Er liess sich 1900 in Berlin nieder, wurde 1901 Mitglied der Berliner Secession und freundete sich mit Rudolf Alexander Schr�der, Julius Meier-Graefe und Gerhart Hauptmann an. Er war im Vorstand der Secession von 1910 bis zu ihrer Aufl�sung 1933: 1925 wurde er deren Pr�sident. Bei der Vorbesichtigung zur Gro�en Deutschen Kunstausstellung im Haus der Deutschen Kunst in M�nchen liess Hitler ein Werk von K�nigs abh�ngen und trat ein Loch hinein. ^ >1843 Anna Peters, German flower painter who died on 26 June 1926. Daughter of the painter Pieter Francis Peters [1818 – 23 Feb 1903], she was also influenced by her maternal uncle Christian Mali. She also painted a few landscapes. Sister of Pietronella Peters [1848-1924]. �- (Flower Still Life) (61x50cm; 1020x822pix, 155kb _ .ZOOM to 2040x1645pix, 644kb) with water pouring out of a pipe behind a snail. 1828 Antonio Rotta, Italian artist who died on 11 September 1903. ^ 1798 Johann Jakob Ulrich, Swiss painter who died on 17 March 1877. He first studied under his father and then in Paris in 1822 in the studio of Jean-Victor Bertin. As a student he concentrated on unusual lighting effects in his landscape paintings well before they became a hallmark of the precursors of the Impressionists. In 1824 at the Salon in Paris he first saw paintings by Constable. On a trip to Italy in 1828 he did studies en plein air as preliminary sketches for his studio paintings. His early paintings emphasize brilliant color, low horizons and scientific observation of cloud formations in a manner similar to Constables studies, which he actually saw on visits to England in 1832 and 1835. Like Eugène Boudin, Ulrich was interested in poetic evocations of sun, water, and effects of atmosphere rather than in the precise delineations of topography typical of Swiss art of that period. From 1824 he showed regularly at the Salons in Paris and in 1837 he returned to Zurich. Because the Swiss public was reluctant to accept his freer, more adventurous style, he often painted traditional landscapes for exhibitions (e.g. Port of Rotterdam, 1844), while at the same time executing more innovative charcoal drawings (e.g. Storm at Sea, 1849) that resemble those of Turner. In his paintings of the 1850s he was able to combine conventional compositions and sensitive lighting effects, as in Waterfall in the Forest (1853) and Moonlight in Sorrento (1858), both of which are poetic images removed from the banality of similar themes treated by his contemporaries. 1680 Jan Baptist Lambrechts (or Lambreck), Flemish artist who died after 1731. ^ 2002 Discovered Rubens's The Massacre of the Innocents to go at auction. Sotheby's auction house announces that it has identified a previously unknown painting by Peter Paul Rubens, one of the greatest Old Masters to be offered at auction in decades. A private owner brought the painting, previously thought to be by Rubens follower Jan van den Hoecke, to the company's attention, and Sotheby's experts determined it was a Rubens. The painting, The Massacre of the Innocents (1611), is expected to sell for anywhere from $5.7 million to $8.5 million when it is auctioned on 11 July 2002. It shows a gruesome, action-filled scene in which soldiers begin to slaughter a group of women and children. Babies' bodies litter the ground, one soldier holds an old woman by the throat as he prepares to run a sword through her torso and blood runs beneath the figures' feet. The painting had been bought by the royal family of Liechtenstein, in about 1700, identified as an early Rubens. But it was later misidentified by their curators.